The All England Lawn Tennis Club. Play begins Monday. The 13-day tournament closes with the women’s singles final on Saturday, July 14, and the men’s singles final on Sunday, July 15. There are no matches scheduled for the two-week tournament’s middle Sunday, July 8. 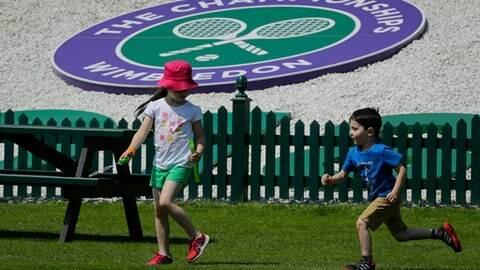 The first match of the fortnight on Centre Court is reserved for the previous year’s male champion, so Roger Federer will be the first player to set foot on the most hallowed patch of grass in tennis. He faces Dusan Lajovic of Serbia. ”It’s a big deal. I mean, besides the history and the mythical place that it is, you cannot … practice on it. When you come out, there’s a bit of uncertainty for both players,” Federer said Sunday. ”The entire atmosphere changes at Wimbledon, and you realize the eyes are on you. That naturally makes you a bit nervous, I believe.” Both Williams sisters are scheduled to play on Day 1 of the tournament, with seven-time Wimbledon champion Serena against Arantxa Rus of the Netherlands on Court 1, and five-time champ Venus against Johanna Larsson on Court 2. Other past major titlists in action include U.S. Open champion Sloane Stephens, Australian Open champion Caroline Wozniacki and 2014 U.S. Open champion and 2017 Wimbledon runner-up Marin Cilic. Sunny. High of 82 degrees (28 Celsius). Federer was a 6-3, 6-1, 6-4 winner in the final against Cilic, who was hobbled by a foot blister. Federer became the first man to win eight Wimbledon titles and extended his record to 19 Grand Slam singles trophies (he made it 20 at the Australian Open in January). Federer was also the first man since Bjorn Borg in 1976 to win the tournament without dropping a set. Muguruza defeated Venus Williams 7-5, 6-0 for her first Wimbledon title and second at a major tournament. Muguruza, who got past Serena Williams in the 2016 French Open final, is the only woman to beat each Williams sister in a Grand Slam final. Serena Williams returns after missing Wimbledon last year while she was pregnant. She gave birth to a daughter last September, and this will be the fourth tournament of her comeback. Williams has a 14-match winning streak at the All England Club, with her sixth and seventh titles in 2015 and 2016, and a 10-match winning streak in Grand Slam action. Also returning: 2004 champion Maria Sharapova, who missed Wimbledon the last two years – in 2016 because of a 15-month doping suspension, and in 2017 because of an injured left thigh. Two-time champion Andy Murray withdrew Sunday because of a bad hip. He had surgery in January and returned to competition less than two weeks ago. 15 – Consecutive Wimbledon men’s titles won by Federer (8), Novak Djokovic (3), Rafael Nadal (2) or Murray (2). ”I got a little emotional when I was telling her a story about a girl who had a big dream. I started getting choked up.” – Serena Williams, discussing bringing her daughter to Centre Court. Total is 34 million pounds (about $45 million), with 2.25 million pounds (about $3 million) each to the men’s and women’s singles champions.